Page Street Publishing, 9781624143366, 192pp. 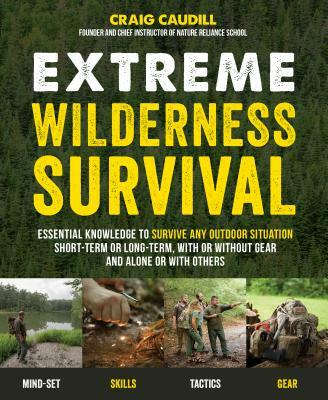 For the beginner and way beyond, Extreme Wilderness Survival has what every outdoorsman needs to stay safe in the woods: the right mind-set, skills, advanced tactics and gear choices based on real experiences. Craig Caudill of Nature Reliance School has spent four decades gathering expertise in outdoor survival—including two 30-day solo sabbaticals in remote woods with only a knife. He teaches military personnel as well as everyday citizens how to avoid trouble and what to do when you can’t avoid it. In this book, Craig puts it all together in a sensible way, step by step, for almost any scenario—from getting lost alone to extreme group tactics. In this book, you’ll learn how to work with nature, not against it, so you can travel with a healthy dose of confidence and caution, stay safe and survive no matter what dangers you encounter. Craig Caudill is the chief instructor and founder of Nature Reliance School. He has trained military groups through the Department of Defense, as well as federal, state and local law enforcement agencies. Craig has written for American Frontiersman, Self-Reliance Illustrated, Backwoodsman and Wilderness Way. He lives in central Kentucky.